A young man rests on a pallet, three swords above, one under him. Though this card (in the Rider-Waite deck) makes the young man look dead, it is really only about taking a break. This is the “meditation” card. The card advises the Querent that they need to get away, rest, recuperate. Especially after the Three of Swords! The card indicates that the Querent has been facing mental or emotional stress, arguments, misunderstandings or verbal abuse, or that they’re ill or injured. A healing retreat is needed, time to clear the head, heart and soul, or just fix a damaged body. In this case, the stillness of the “4” is healing and positive. A quiet, unchanging scene is needed. This is the third in my “crappy motel” themed paintings and my favourite out of the three. I learnt a lot of stuff doing the other two and I wanted to try something new, perspective wise, with this one. This takes place in early season 4 when Dean and Sam have only been reunited a short time. I wanted to show Dean resting as the card suggests, but also hint that not everything is as unchanging as it might appear. 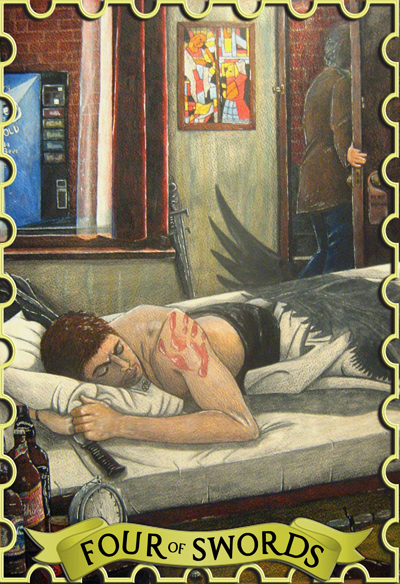 So Sam is sneaking out to meet Ruby and, presumably, Castiel is standing over Dean’s bed (the creepy stalker) with his wing casting a shadow over his sleeping body There are four swords/blades but one of them is harder to spot as its behind the one leaning against the wall. The other two are the sword on the floor and Dean’s knife that he sleeps with. The painting on the wall is the stained glass window that appears on the Rider Waite version of this card.